In order to use CodeBug with codebug_i2c_tether you need to program CodeBug with codebug_i2c_tether.cbg (download). To do this, hold down button A and plug in CodeBug via USB — it should appear as a USB drive — then copy the codebug_i2c_tether.cbg file onto it. CodeBug is now ready to be used via serial USB. Press button B to exit programming mode. When CodeBug is connected to a computer via USB is should now appear as a serial device. To reprogram CodeBug: hold down button A and (re)plug it into a USB port. 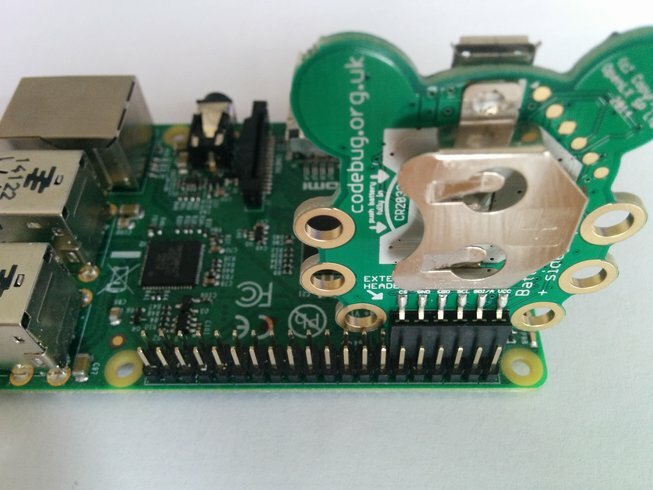 Unplug CodeBug, remove the battery (if one is inserted) and then plug CodeBug’s extension header into the I2C GPIO pins on the Raspberry Pi. These are the left-most inner row GPIO pins on the Raspberry Pi with CodeBug facing in. The middle pixel on your CodeBug should light up. See Examples for more ways to use codebug_i2c_tether.